This tip/technique goes quite nicely with the CAS style. 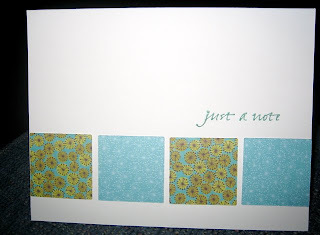 Basically, start out with a neutral card base, then get a piece of scrap paper that is the same size as your card front. 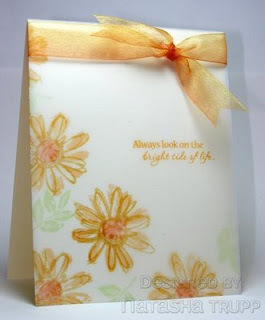 Cut or tear a shape out of your scrap paper. Using temporary adhesive, attach the reverse mask to your card front. Decide on a colour palette and start sponging colours into your shape. 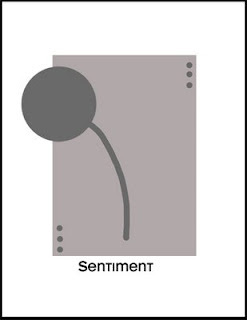 Next, add in some images and a sentiment. Remove the mask, finish off with ribbon if you like. The effect makes quite the impact. This has been a favorite technique of mine for some time now, so I thought I'd show you a few items I've made over the years. This first one is really not much of a CAS style, but I wanted to show you that you don't have to make your reverse mask be card front size. Also, this shows how a torn shape can make a very effective look. 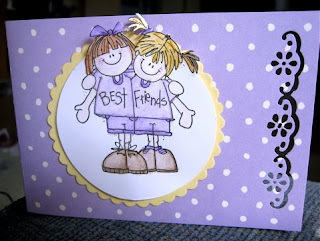 This next one is card I made for last year's Dare to Get Dirty celebration at SCS. 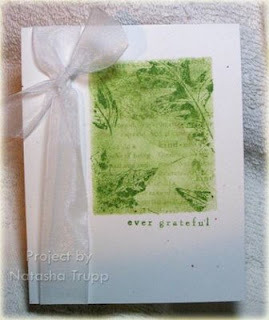 For this one, I cut out the rectangle free hand, sponged a few greens, and stamped over with leaves and definitions. I went with a rectangle on this one as well. I kept with browns and nature themed images again. So even though each of these card has a more elaborate collaged type look, they come together quite quickly and look really impressive. If you need a gift set for someone, I highly recommend doing something along the lines of the bottom two. 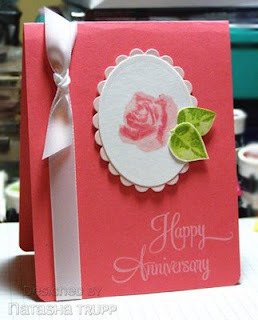 Overlays are definitely a quick and easy way to add a little bit of WOW to a card. There are several amazing ones available for purchase. 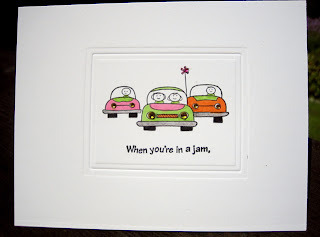 Of course, if you have a bit of vellum or acetate and a decent permanent ink, you can go ahead and make your own. This is the first time I have ever used vellum. 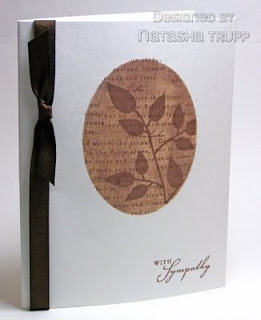 I used the PaperTrey Linen Vellum cardstock for the card base and stamped the leaves on the card front. 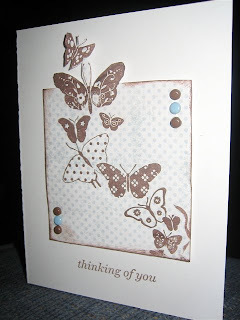 I then used Black Staz-On and stamped the sentiment on regular vellum and attached it to the card front with mini glue dots. I added the ribbon at the top to finish it off. 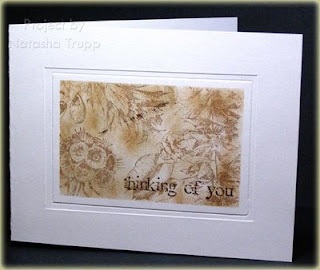 Supplies: Stamps - Verve Serenity; Paper - PaperTrey Linen Vellum, PaperTrey Vellum Cardstock; Ink - SU! 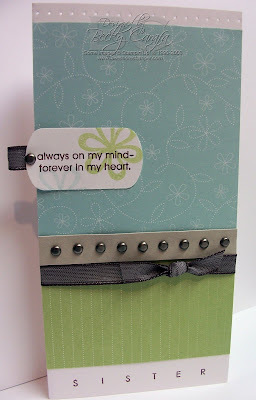 Old Olive, Black Staz-On; Misc - Ribbon, glue dots. 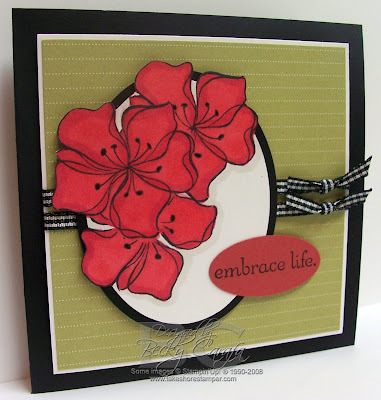 Word borders are a quick and easy way to jazz up the area surrounding your main image. 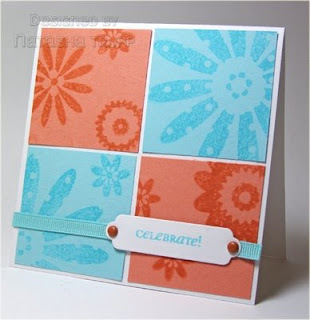 With all the clear stamps out there, this concept is even easier than ever to use! 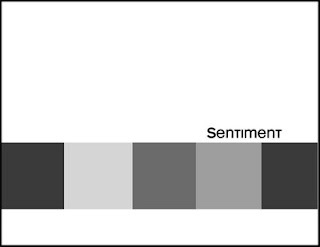 On my example, I didn't have a sentiment that was the whole length of the main image. 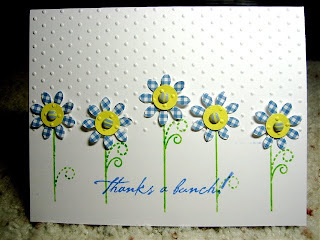 Instead I used the small one twice, using a cute flower as a spacer. Punches! 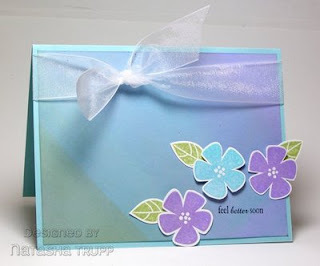 These tools are absolutely fabulous for making card making that little bit quicker. Punches can also provide you with options that wouldn't be so easy to come by using simple, but time consuming hand cutting techniques. There are so many cool shapes out there. I went with circles for this design. 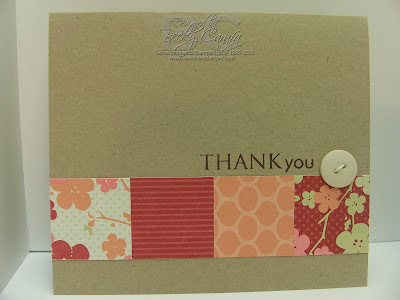 Using a nice vanilla card base, some chocolate paper, and some coordinating pattern paper, I had a card in minutes! In keeping with the colour blocking theme, I thought this sketch would be a good one for this week! 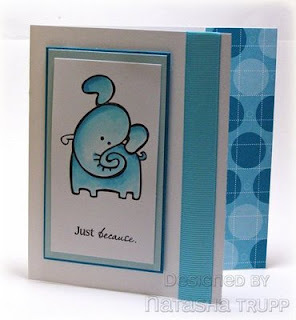 This design works well with plain cardstock, stamped cardstock, or patterned paper. If you're wondering about measurements. I made each square about 1-1/8, then I placed the middle one first, and lined up the rest. The two on the ends went over the side just a bit, so I trimmed it. Also due to the awkward size of each square and my less than precise cutter, I decided to add a border. 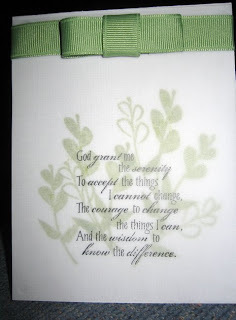 This adds nicely to the design and hides the fact that one of my squares was a bit too small. I like to round the corners of this design. I find it completes the card nicely. 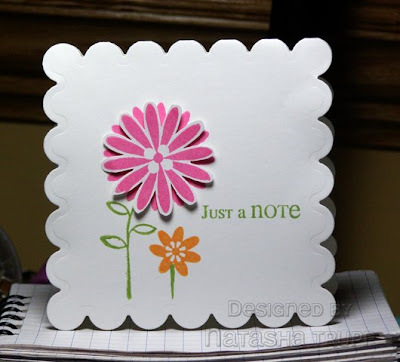 This design is great for mass producing (if you have a more precise cutter) and also for using up those awkward sized scraps that we all feel compelled to keep! 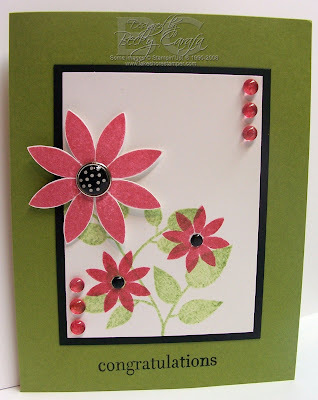 On my card I went with the colour challenge from last week at SCS. 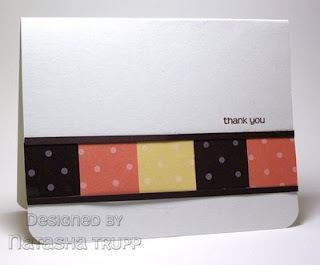 I stamped some polka dots over top, added my border, and a greeting . That's it! I strayed a bit from the sketch but have the same out of the box idea. I stamped the butterflies image (all one image) on My Minds Eye paper, then with a see through ruler penciled the box around the image up to the butterfly's wings on each side. 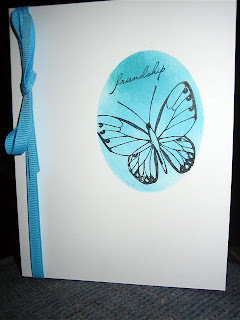 I used my paper trimmer to cut 3 sides, then hand cut the top and around the butterflies. 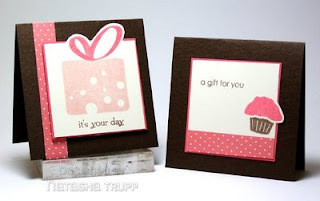 Supplies: Stamps - Inkadinkado, Papertrey; Paper - PaperTrey Stampers Select. MME dp; Ink - Versamagic Jumbo Java; Misc - brads, dimensionals. 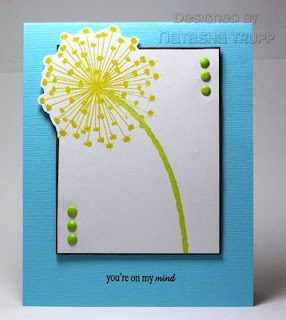 Today's tip is something that brings a fun twist to any regular layout. It's just that little extra something different. 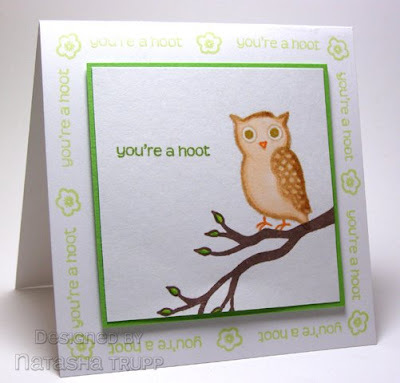 When I use the term out of the box, I don't mean coming up with different ideas for your stamp images (although that's always a good idea!). I mean the technique where you have your image emerging from the image panel. It goes beyond the typical borders. 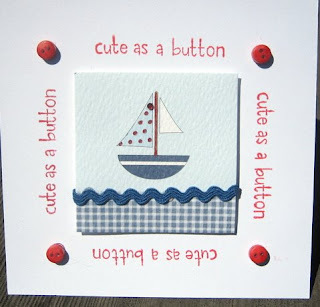 I made 2 cards featuring this technique. It really doesn't matter where you choose to have the image emerge. 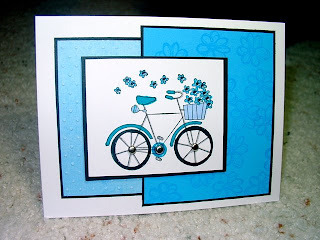 One the one card I had the cupcake spill over on the right side. 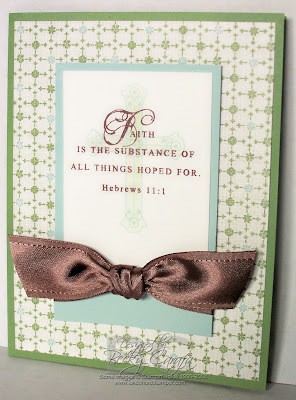 On the other card, I had the bow coming out over the top of the panel. I find there are 3 tools you need to help make this technique a success. You need a pencil, a clear ruler, and a decent pair of scissors. 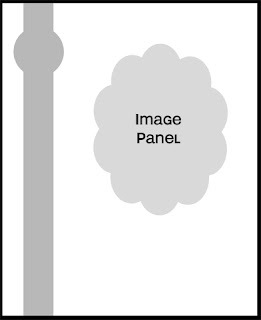 I start by stamping my image on a larger than necessary panel. Then I take my clear ruler and go over the image on each side, seeing which way would look best. Next I draw a faint line, excluding the image. I cut out along the pencil line, then go around the image. 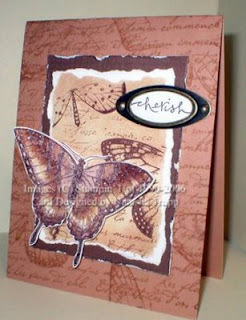 An easier way of doing this technique is to stamp your image partially on one panel, then cut out the part that will be emerging over the edge and adhere it over top with a pop dot.